Donnita Hamilton was fishing with Capt. 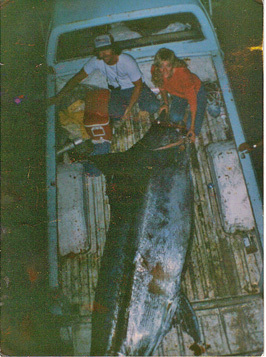 Timmy Gray on the TERROR RISER in 1987 when she caught her grander. They were 17 miles outside of Nanakuli when they hooked up and Donnita fought the fish for the next 51/2 hours. It took them nine hours to tow the monster back to port. The following day, the fish had to be cut into three pieces to weigh it on the scales at United Fishing Agency. Total weight: 1157 lbs.